This Saturday’s match-up features two teams that call Columbia home. One of which is an SEC vet and one in its first season in the nation’s toughest conference. With both schools featuring, or rather maybe not featuring, injured starting quarterbacks, this game could end up being decided by back-ups. 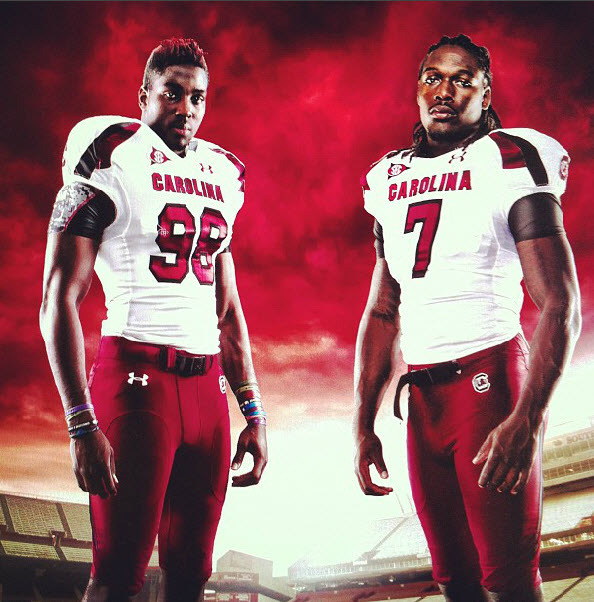 Not only will the Gamecocks potentially lose Connor Shaw with the first hit he takes, but they will definitely be without star defenseman DJ Swearinger. This week he was suspended for a helmet to helmet hit that occurred in last week’s UAB game that the league commissioner deemed a dangerous hit. While it seems that the coaching staff is not thrilled with the suspension (due to Justice Cunningham incurring a similar hit in the Vanderbilt game for which the Vanderbilt player was not suspended), it’s what Spurrier referred to as something they will deal with. This suspension, along with some other players being banged up will allow for our first glimpse of TJ Gurley. The true freshman is expected to be a big part of the defensive scheme this week, and according to the coaching staff he is ready for the big stage. Missouri is no slouch. A few weeks ago they went toe-to-toe with Georgia for much of the first three quarters of the game until the Bulldogs came up big and put the game out of reach at the end. If nothing else this showed the nation that the Tigers are ready for their first year in the SEC and they are no pushover. Regardless of who starts at quarterback for Missouri, they will move the ball and move it quickly. The Tigers offense will keep the Gamecocks defense on the field for extended drives so conditioning will play a big part in this game. The Tigers offense stays on the field. Even while missing starting quarterback James Franklin last week the Tigers led the possession battle at 34:51. This equates to a lot of time on the field for the opposing teams defense. If Carolina’s defense isn’t well conditioned for extended amounts of time on the field, this will be the game where it shows. These long drives also mean that when the Gamecocks do get the ball they must put points on the board against Missouri’s tough defense, which features last week’s SEC Defensive player of the week, Kenronte Walker. The senior strong safety showed up big in last week’s win over the Arizona State Sun Devils in late game-saving drives. Walker will look to continue his strong season against Carolina’s, at times, shaky offense. As I say almost every week, Carolina’s defense must play big and step up in order for the Gamecocks to leave Saturday’s game 2-0 in SEC play. The defensive line will need to put pressure on whoever is playing quarterback for the Tigers in order to slow down the game and insure that USC can win the possession battle. Along with the defense playing big, Carolina’s offense must score points. While this seems obvious, it is especially important to put points on the board every possession when playing a team like Missouri that often wins the possession battle. There may not be a lot of time or opportunity to score if the Gamecocks get in an early hole so they must convert on every possession. Luckily for the Gamecocks, putting points on the board has not been a problem the last two weeks. With the infusion of Dylan Thompson’s passing ability it has allowed for Carolina’s offense to become much more vertical. Many Gamecock faithful are hoping that Spurrier will find a way to use both quarterbacks for their strengths and of course utilizing the best running back in the nation in Marcus Lattimore. The Gamecocks will pull out a very close victory against their new SEC East foes but it will not be decided until late in the game. Carolina’s defense will prevail in their battle allowing the Gamecocks’ offense time to put points on the board. MU: Keeping their offense on the field and wearing down Carolina’s defense will be the key for them to have a chance at the end of the game. USC: The defense must create turnovers and give Carolina’s offense a short field to convert points at every opportunity.